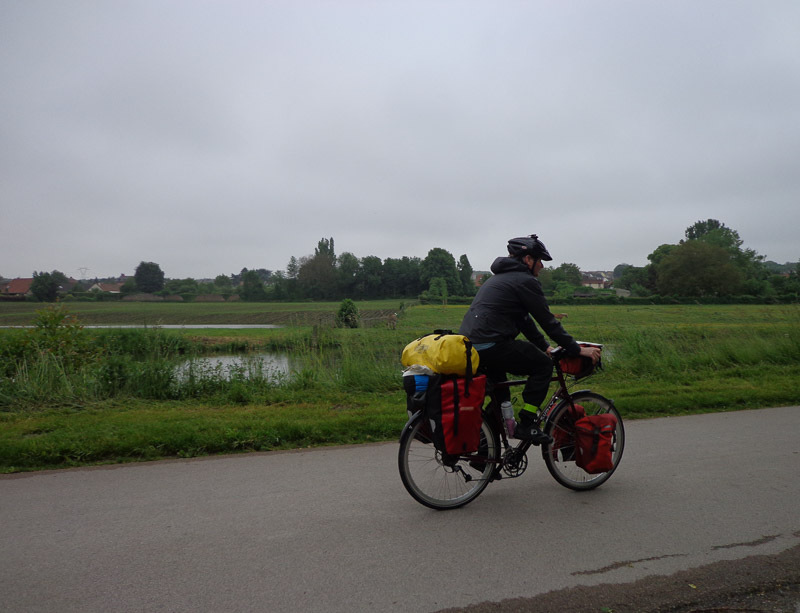 Finally, on June 1, we happily left Amiens under overcast skies and rode the Vioe Vert (bicycle greenway) most of the way from Amiens northwest to Abbeville, nearing the Atlantic coast. The bike trail along the canal started as a paved road, then turned into a nicely graded dirt road, then to a not-too-bad two-track road, and eventually into a bumpy, rutted single track before we finally aborted and found our way into Abbeville on surface streets. There were also a few not-so-well marked construction detours that did their best to get us lost, but we’re beginning to get smarter and didn’t fall for most of our GPS’s tricks! It was a very quiet, tranquil, flat and easy ride. We finally started making some tracks (47 km today – our record to date!). 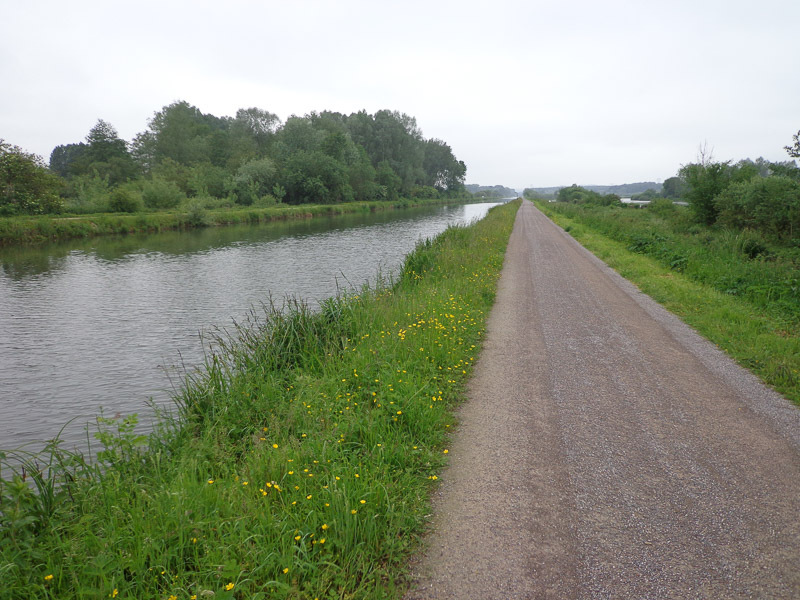 And we had very few navigation issues since we followed the canal route nearly the entire way. 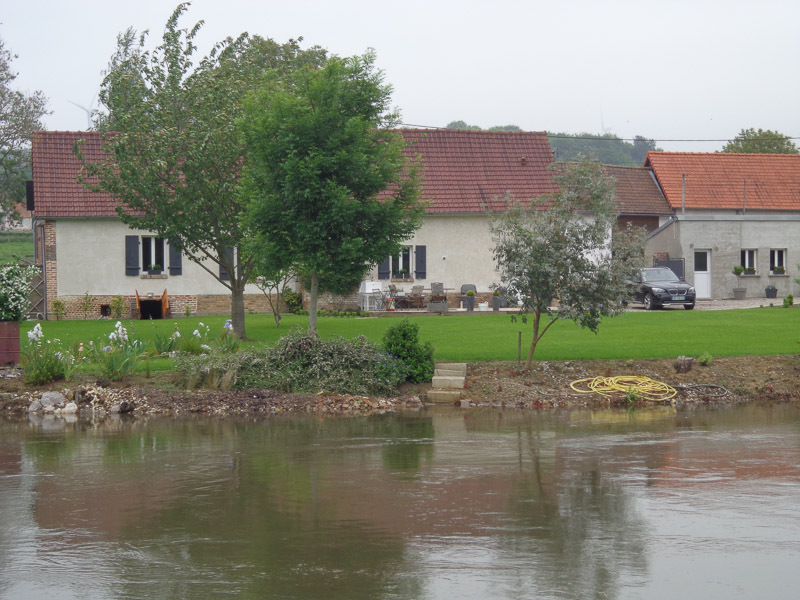 Don’t homeowners along the canals worry about flooding??? It was overcast throughout the day, but not cold as long as we kept moving. 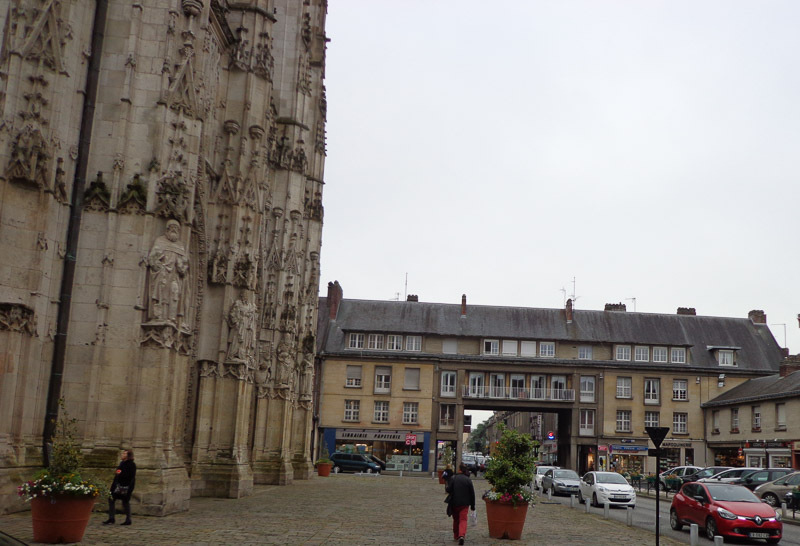 When we finally arrived in Abbeville in the late afternoon, we scored free wifi at the very friendly and helpful tourist information office. Shortly after arriving, it started raining buckets again. We were not looking forward to riding another 5 – 10 km to the nearest campground to spend another wet night in our tent. When I checked email, I found that a couchsurfing request we had put out a few days earlier had been accepted! 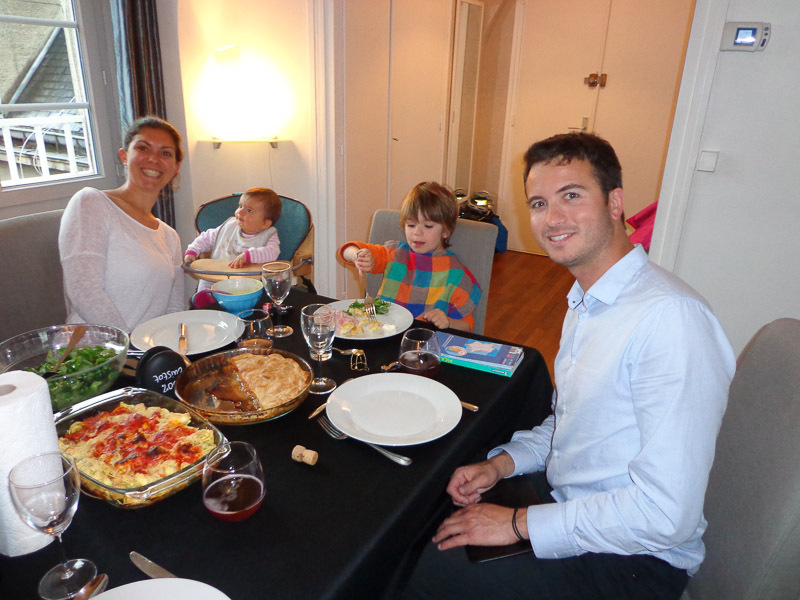 Even though we confirmed at the last minute, Denis and his beautiful family very generously invited us into their apartment in the heart of Abbeville, not a 5-minute walk from our shelter from the rain at the tourist information office. The view from our bedroom window. We’re literally spitting distance from the town’s main church. When we arrived at 7:00pm, Denis’s wife, Laurence had dinner nearly on the table. The aromas wafting from the kitchen were heavenly! Denis and Laurence showed us to our bedroom and offered to do some laundry for us! What champs! I hadn’t washed some of my merino wool (which I wear daily) practically since we arrived. Generally speaking, merino wool is magic. The one downside to merino wool (well, all wool, really) is that it can’t go in the dryer. With all the rain we’ve had, there was never an opportunity to wash and then drip dry our wool. Thanks to Denis and Laurence, and their toasty warm flat, I am currently sporting a freshly washed shirt! Yay! It’s the little things in life. Over dinner, we got to know Denis and Laurence better. They have two children, aged 3 ½ and 8 months, and both are adorable. Clement, the 3 year old, has a mop of hair that somehow manages to look fetchingly windblown instead of messy. And Camille, the 8-month old, has a perpetual smile. 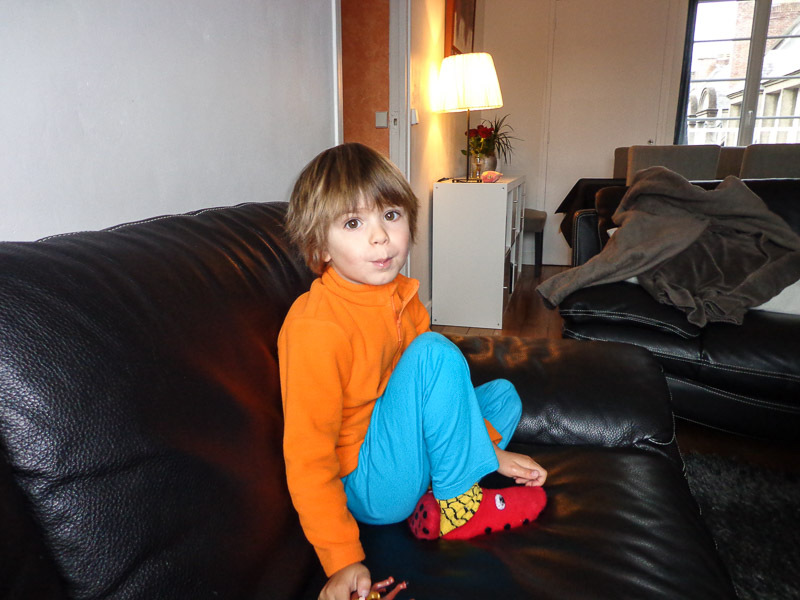 Both children are comfortable with strangers, and Clement invited us more than once to stay much longer. Denis is an engineer, and a manager at his company. But his ambition is to be a professional kite flyer. He had an opportunity to join a pro team a few years back, but turned it down because he needed the stability of a regular job to maintain his young family. I think he regrets turning down the opportunity, however, and he is looking to find sponsorship. Turns out kite flying can be quite lucrative, as much as €3000/month plus all expenses paid to travel and perform around the world! Not a bad gig! We wish Denis good luck! Laurence is currently a stay-at-home mom. From what we understood, France grants maternity leave of up to 18 months – not at full salary the whole time, mind you, but still! She has signed up for 12 months, and will likely extend it another 6. We ate a delicious, home cooked meal and then enjoyed watching some of Denis’s amazing kite flying videos. Wow! Four people on a team, all flying their kites in formation. It shouldn’t be called kite flying, but kite dancing! They also asked us to explain American health insurance policy and Donald Trump. I don’t know if we successfully explained either phenomenon. We had a wonderful time and really enjoyed not only their company and warm hospitality, but also a warm bed, a clean hot shower, and a fresh load of laundry. 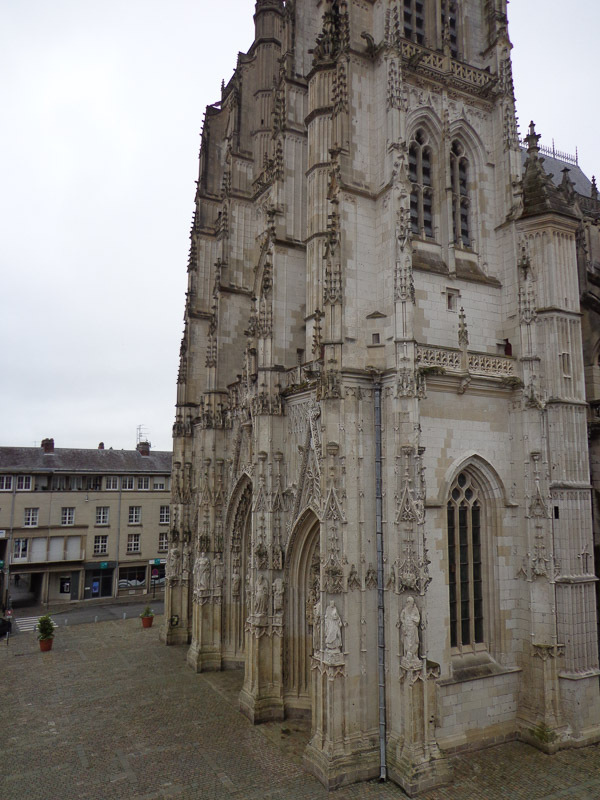 It was much appreciated after the cold, wet nights we’ve spent since leaving Patrick and Marie in Beauvais.